Stock 2"x8" ribbons with event card and string. Various colors. Available in 1st-10th place, Special Award, Honorable Mention, and Participation. Antique gold finish and cute star shape. Approximate 2" diameter. Your choice of neck drape color. Makes a great economical participation medal. Note: Due to the cutouts and shape of this medal, we do not recommend adding lettering. Bright gold Midnite Star series figures with black contrast detailing. Black genuine marble base. 6" tall. Cherry finish plaques with your choice of sport theme relief. Three sizes. 40 characters of lettering included per item. $0.10 per character after first 40. Additional lettering may be charged separately after checkout. 3 1/2"x6 1/2" Stock Ribbon Rosettes available in 1st, 2nd, 3rd, Honorable Mention, Achievement, and Participation. Card on back to fill in with your event details. Satin button, pin back. 6 1/2"x10" Stock Ribbon Rosettes available in 1st, 2nd and 3rd. Card on back to fill in with your event details. Metallic gold button. Stock 2"x8" ribbons with event card and string. Stock 2"x8" ribbons with event card and string. Various colors. 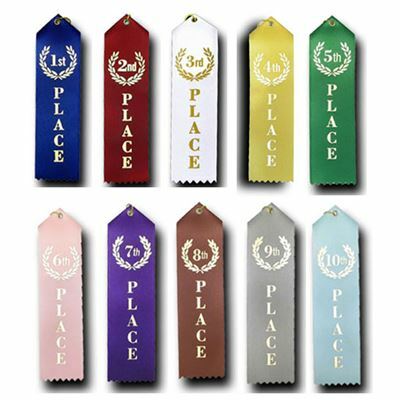 Available in 1st-6th Place, Honorable Mention and Participation.